History of the Dead Sea - Discover the Dead Sea with Us! The Dead Sea is a place you must visit at least once in your lifetime. This unique spot is the lowest place on earth, and combines turquoise waters with majestic sand-colored hills all around them. Only an hour’s drive from Jerusalem, and a 2 hours’ drive from Tel Aviv, the Dead Sea can make for a wonderful day trip if you wish to see more of Israel’s varied landscapes. The mineral-infused mud of the Dead Sea and its ultra-salty waters are known for their healing properties, and many people visit the place for the purpose of improving various skin conditions. But these are not the only unique things about the Dead Sea. It also has a very special history. From Biblical times, through the Greek and Roman period, and until modern times, the Dead Sea has featured in many historical moments of significance. Interested in knowing some Dead Sea history facts? Keep reading. During the Biblical period, different sects of Jews used to live in caves near the Dead Sea, most notably the Essesnes, who left the impressive Dead Sea Scrolls in the caves of Qumran. Sodom and Gomorrah, the famous cities mentioned in the Book of Genesis, are believed to have been on its southeastern shore. Ein Gedi, now a nature reserve near the Dead Sea, is mentioned in the Bible as the place where King David hid from Saul. The ancient history of the Dead Sea encompasses many of the Middle Eastern and Mediterranean peoples of the time. The Nabateans, for example, used to harvest the sea’s natural asphalt, and in all probability, the Egyptians bought it from them. The Romans, too, referred to the Dead Sea as “Palus Asphaltites” (Asphalt Lake). But perhaps the best-known moment in Dead Sea history in the ancient times was when a small group of Jewish zealots fled to Masada (a fortress built by King Herod the Great on a hill overlooking the Dead Sea) following the destruction of the Second Temple, in the year 70 AD. In 73 AD they were sieged there by the Roman X Legion, and rather than surrender, they chose to die by mass suicide. During the Byzantine period, Greek Orthodox monks also came to this area for refuge. They built several monasteries in the vicinity of the Dead Sea: the Saint George monastery in Wadi Kelt is one of them. 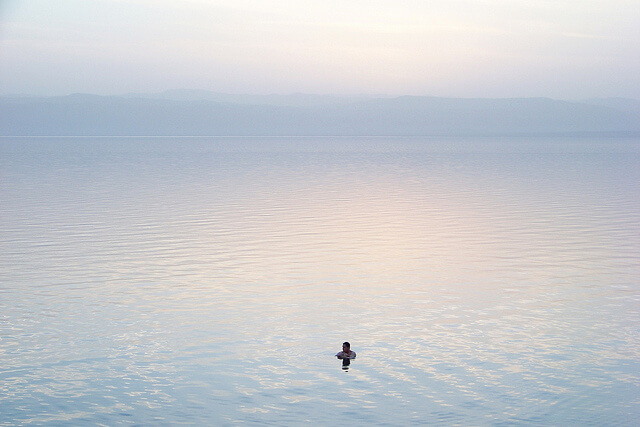 Prior to the 19th Century, the Dead Sea was merely a mystery to the developing world, shrouded in references in the Bible, but unknown, unexplored and uncharted. But then, several different explorers started uncovering its mysteries. The first known modern-era explorer of the Dead Sea was a pioneering young Irishman named Christopher Costigan, who had become interested in the Holy Land during his studies for the Catholic Priesthood. He set off on an expedition in 1835 having no navigational maps to guide him for the navigation of the Jordan River and Dead Sea which post-dated the Middle Ages. His 8 days of scientific exploration on the Dead Sea, with a lack of fresh water and an absence of winds for sailing, caused Costigan to boil and drink the brackish water of the sea. Probably suffering from massive dehydration, he contracted a severe fever. His assistant left him on the northern shore of the Dead Sea and went seeking help to the nearby Greek Orthodox Monastery of Deir Hijla. Taken for medical assistance by mule to Jerusalem, Costigan was dead on arrival and later buried on Mount Zion. Unfortunately, all of his notes and research were lost with his boat. 13 years later, Lt. William Francis Lynch of the US Navy was luckier. In 1848, Lynch undertook an expedition to the Dead Sea with a large team of men and two boats. Lynch’s expedition created the first published charted maps of the Jordan River and the Dead Sea. Over 20 years passed before an intrepid Scotsman, having sailed the newly opened Suez Canal and the Nile with his canoe, arrived in the region. Previously visiting the Sea of Galilee, John MacGregor canoed the entire length of the Jordan River to the Dead Sea. He named his canoe “Rob Roy”; discovered not long ago in Britain, it has been brought to Tel Aviv’s Eretz Israel Museum. In 1868, the “Moabite Stone” (an inscribed stone set up by king Mesha of the ancient kingdom of Moab) was found on the plateau east of the Dead Sea by Frederick Augustus Klein, an Anglican missionary. However, in 1869, the stone was smashed by local villagers when they argued over its ownership. The early 20th Century would see the work continued by the PEF (British Palestine Exploration Fund) and by Jewish-Siberian scientist-engineer Moshe (Mikhail Abromovitz) Novomeysky, who read the research on the Dead Sea by German geologist Blankenhorn, took samples of minerals, found they were in commercial quantities and founded the Dead Sea Works. The late 1940s and early 1950s brought one the of the most significant Biblical discoveries in history: the Dead Sea Scrolls, hundreds of religious documents dating from the period between 150 BC and 70 AD, were found in the Qumran Caves, about 1.6 km from the northwestern shore of the Dead Sea. Their first discoverers were three Bedouin shepherds, Muhammed edh-Dhib, Jum’a Muhammed, and Khalil Musa in 1946-47. In the years 1951-56, the caves were excavated by a team from the ASOR (the American School of Oriental Research), and more scrolls were found. Last but not least is a meaningful scientific discovery made in 2011. A group of Israeli and German scientists dived into the depths of the Dead Sea and discovered fissures in its floor, which allow the entrance of fresh and brackish water into it. After sampling biofilms surrounding the fissures, they discovered the seas to be not so dead after all: many species of bacteria and archaea were found in them.